In 2010 and 2011, just 2,500 top bankers earned enough in bonuses to bring all 750,000 Londoners currently on poverty wages up to a living wage. Who could possibly think this is fair and justifiable? 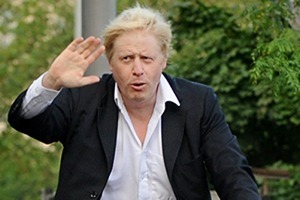 Perhaps only the most unabashed defender of bankers and hedge funds, Boris Johnson, the mayor of London. Today I’ve published a report detailing his one-sided defence of London’s financial services. I’ve uncovered the letters he sent to the European Commission opposing regulations on hedge funds and the Financial Transaction Tax, and the official City Hall press releases where he quotes – without reference – anti-regulation think tanks and industry insiders. We all know the Mayor defends London’s most notorious industry, but did you know that he has only ever travelled to Brussels to lobby in person once, for the hedge funds, and that of the three occasions he has lobbied the European Commission formally, two have been for the hedge funds and financial markets? What about all the other industries in London and their concerns with European legislation and regulations? Did you know that his deputy mayor for business and enterprise, his chief economic advisor and his previous policy director for economic development all have close links with the city? I won’t get into all the details here; you can download my report for that. But I do want to say something about Boris’ starting point, and why I think it’s wrong. The mayor’s priorities are jobs and economic growth, and his vision is to make London the “greatest city on earth”. He boasts of the sector’s 330,000 employees, its growth and its tax contributions. So he lobbies against any regulations that might put the City and Canary Wharf at any disadvantage relative to its competitors, anything that might cramp what he calls its “dynamism”. But where does this get us? Academics at the LSE have shown how their dynamic culture of bumper bonuses has been a leading cause of our appalling levels of inequality, which has fed into our terrible housing crisis. Remember that speech he gave last year about inequality, where he said “some measure of inequality is essential for the spirit of envy and keeping up with the Joneses that is, like greed, a valuable spur to economic activity”? He also said he didn’t want to see another decade of Gordon Geckos, and that he hopes the super-rich are also super-philanthropic. So it’s okay if we return to an Edwardian society, as long as the rich dole out some cash to homelessness charities and consider – voluntarily, of course – paying a living wage. But it really doesn’t need to be this way, and measures like the bankers’ bonus cap would be a step in the right direction. London is the world’s preeminent global finance centre – only New York can claim to meaningfully compete. It’s our banks and financial markets that have financed our wasteful high-carbon, high-debt economy. But they could be so different, funnelling money into infrastructure like public transport, energy generation and waste disposal. They could make their money supporting small businesses, rather than make money off their backs with ridiculous charges, or worse, ignore them completely. We all need bank accounts and pensions. But I want my money invested ethically and many others feel the same. Instead of our anything-goes casino banks, hauled up for billions in fines every year for dodgy practices, imagine if London were a smaller but more respected global hub of high quality financial deals, emulating the global status of our legal services for commercial deals. I find it very depressing that our Mayor isn’t noisily making these arguments. He occasionally expresses qualms about the sector’s worst excesses, but generally wants to see things stay as they are. I think Londoners need a mayor who looks at all sides of the argument, who has a vision for a more equal and ecologically sound city, and who lobbies for radical reforms to make this happen. Presumeably because these were matters where the European Commission was proposing changes that Boris perceived as detrimental to London’s interest. There may well be a couple of thousand bankers receiving astronomical bonuses, but the vast majority of the three hundred thousand or so people working in finance are ordinary Londoners on ordinary rates of pay. In the absence of a specific example either in the article above, or in the report, it is difficult to understand what point Ms Jones is making. When you say, “imagine if London were a smaller but more respected global hub…” you actually mean reducing the size of one of the largest employers and net tax contributors in the UK. So what you really mean is redundancies. As Bill Ellson rightly points out below, the vast majority of people who work in the city are not the stereotyped Gordon Gekko types but people on relatively ordinary salaries. These are the people you would make redundant. Perhaps you’d like to break the news to them? I do wonder when I read articles by people like Jenny Jones whether they have any understanding of the financial services industry, or indeed any understanding of what financial markets are or how they work. They seem to take their views from films like the Wolf of Wall Street or Boiler Room. They’re all evil and greedy and grind widows and orphans under their boots just to make a few quid. It is complete rubbish. Of course a culture of making money exists, because that’s what the industry produces. But that’s like saying the car industry is evil because it tries to make money on cars that it sells rather than being benign and just providing free cars to everyone. Boris Johnson is rightly trying to protect our financial services industry and the people who work in it; Jenny Jones wants to attack it and the people who work there. Incidentally, Ms Jones, ‘academics at the LSE’ are so left wing that they will produce any piece of left wing biased ‘research’ that you wish. Quoting them is completely meaningless. Your background in archaeology really shines through here.